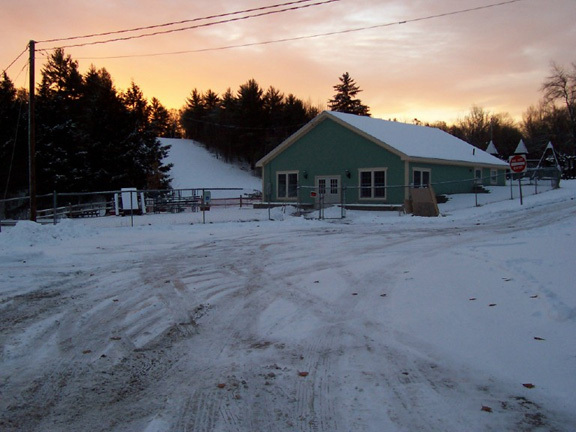 In 2007, a slope was cleared by the town for tubing, and a new pool house/snack bar that was built where the original building was but a lot smaller. So, Benjamin Hill is back for winter sports! Also affectionately known as "Benji Bump", Benjamin Hill was certainly a small vertical ski area. The total in publications was 100', but we estimate it to be slightly shorter, at 85'. This is about 1/3 of nearby Nashoba Valley in Westford. Still, the area had 8 lifts at one point! 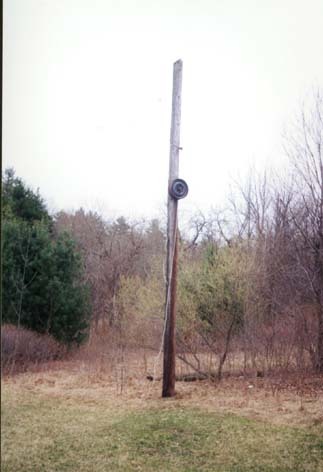 The main lift was a classic Hall T-bar, likely installed in the 1960-1962 timeframe. There were also 3 sets of dual rope tows, and a beginner rope tow. Here is a trail map from a 1969-1970 guidebook, provided by David Hilton. This was the area at its peak. For trail lengths, the far left dual tows were 720' long, the next set 590', and the T-bar 590'. The far right dual tows were 540' long, and the beginner lift was approximately 150' long.. The longest run was 1200', and was taken from the far right lift to the bottom left lift. This was basically a wide open slope ski area. 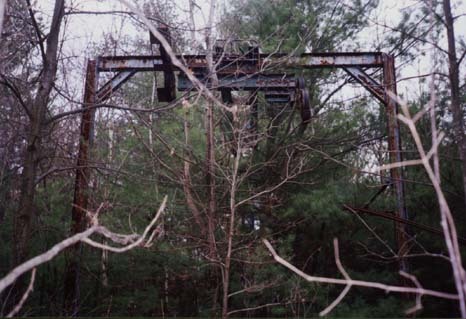 According to NELSAP readers, the far left slope and dual rope tows were not used often, and may have been abandoned in the later years of operation. This early 1970's trail map from the New England Ski Museum was from a northern MA ski brochure. 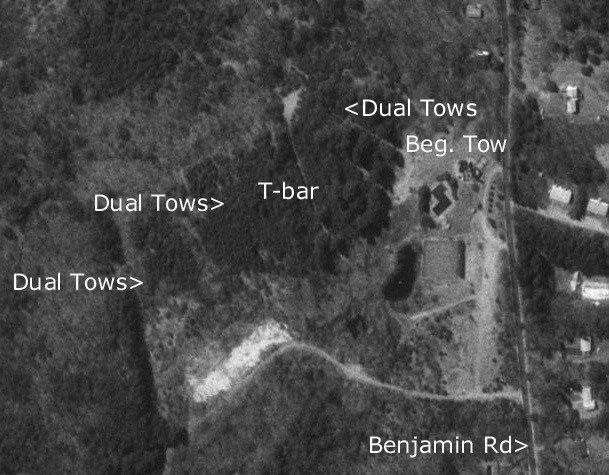 It shows less emphasis on the far left slope and dual tows - so they likely were not in operation anymore. This confirms what our readers stated. The statement at the bottom is funny and definitely dated. Other areas listed on this brochure had similar phrases, so I do not think that Benjamin Hill came up with it. 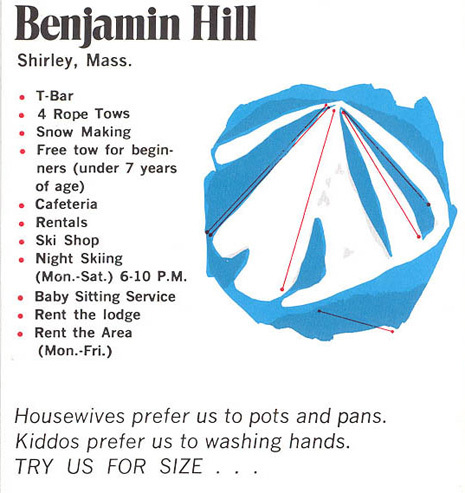 Despite its small size, Benjamin Hill had snowmaking, a fully functional lodge with a cafeteria, and many ski instructors. This area taught many how to ski in a fun and friendly environment. Many skiers were from nearby Ft. Devens in Ayer. Torch light parades were common at the area too. 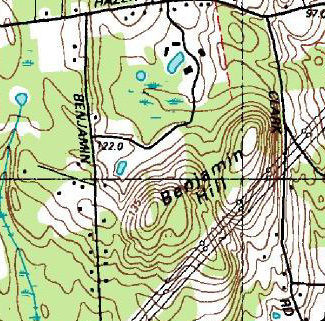 This topo map shows the hill off of Benjamin Road. 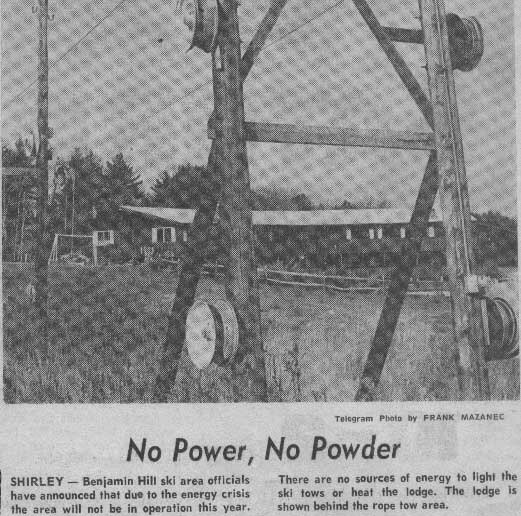 Like many small ski areas, the energy crisis in the 1970's took its toll. An article provided to us by Brian O'Malley (Left) shows that the area did not operate with one year due to no fuel. It is likely that was 1973, and that the area did not reopen. Thereafter, the base lodge burned at some time in the 1970's, and the area was never to return. The area today is still used by the town for recreation, swimming, and tennis. The trails/slopes have grown in tremendously, but some paths exist up the area. 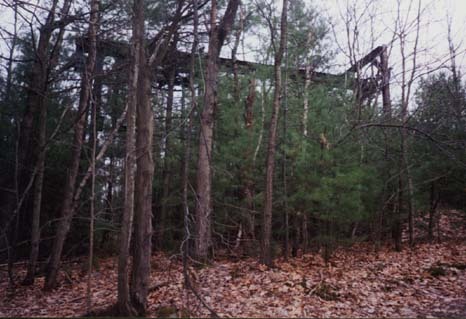 Remains of most of the rope tows exist, as well as the engine and summit return for the T-bar. This is a good area to check out if you want to see a lost ski area. It is located off Benjamin Road in Shirley. Check out photos from 1998 below. This Terraserver image shows the grown in slopes in 1995. Important features are shown. 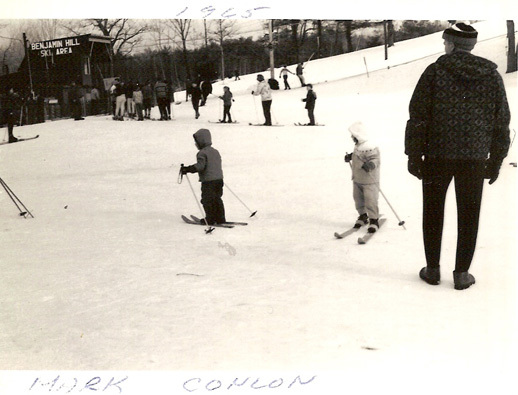 Mark Conlon, the Supervisor of Kid's Mountain School at Park City Mountain Resort, was a frequent skier at Benjamin Hill in the 1960's. His family was deeply involved with the ski school. He has sent us some terrific photos of the area in the 60's that show it as a vibrant and happy place. Here are his details and photos. For all photos, please click on them for the larger version. 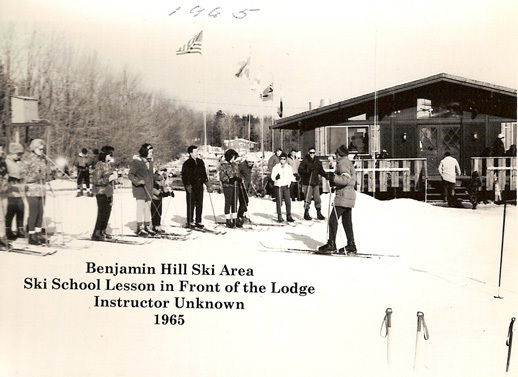 I remember learning to ski and then race at Benjamin Hill. My family was involved with the Ski School. 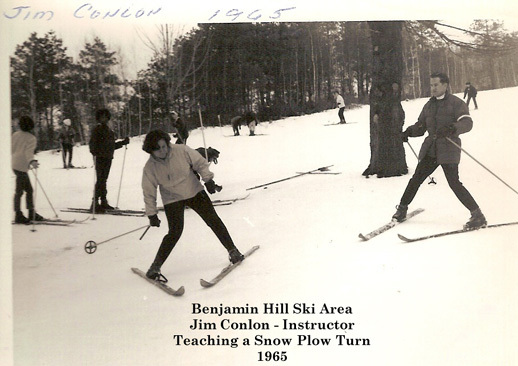 My father Jack Conlon, and my uncle, Jim Conlon were Instructors. My mom Lauretta Conlon worked at the Ski School Desk. Like many I have very fond memories of Benjamin Hill. I broke my leg at seven years old trying to keep up with the older kids. I am writing to you from Park City Utah. I work here as a Supervisor in the Kid's Mountain School. I have worked as a Ski Instructor for over twenty years. My ski career as taken me to Colorado, Lake Tahoe, Japan, and Utah. I look to continue this career until I can't put on my boots. It all started at Benjamin Hill in Shirley Massachusetts. 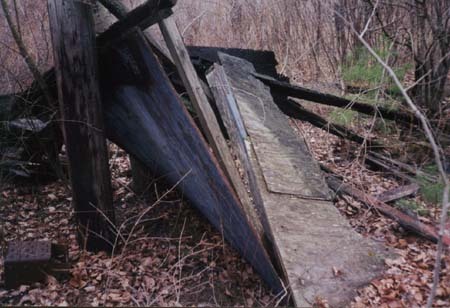 The base of the T-bar in 1965 shows that it was indeed a Hall Lift. As sad comparison, please check out the 1998 photo below. The base of the T-bar can be seen here, along with some skiers riding it. More of the base, showing a liftline. The lodge as it appeared in 1965. Parking lot in background. 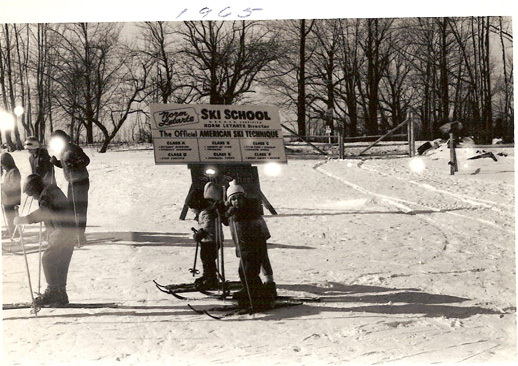 Ski school meeting in front of the lodge, 1965. Susie LeBlanc, a ski instructor, stands in front of the slopes. Note how clear they area! The slope has now nearly totally grown in. Compare this to 1998. 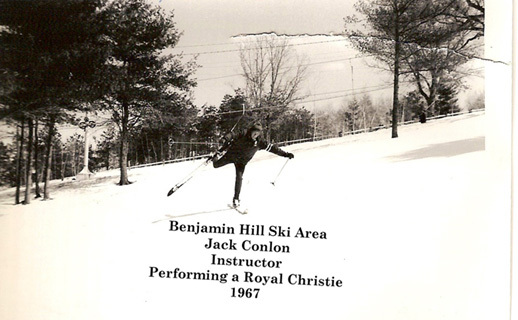 Jack Conlon, a ski instructor and father of Mark, performs the Royal Christie on the slope just right of the T-bar. The Norm Letarte Ski School used the Official American Ski Technique. Jim Conlon, Mark's uncle, teaches a lesson. The beginning of the race. End of T-bar in background. Woodward Bousquet sent us this patch of Benjamin Hill. 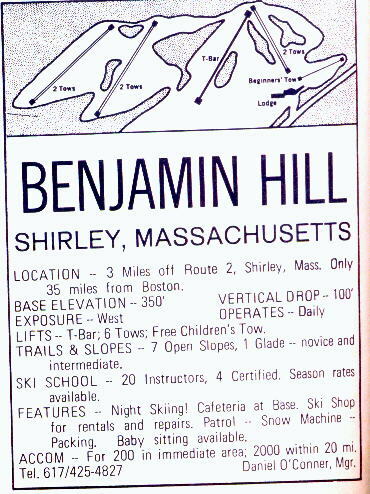 Art Micallef: While stationed at Ft. Devens (another lost NE place) in the late 1960's I learned to ski at Benjamin Hill is Shirley MA. It was a real small place with a rope tow and a T-bar. Maybe 100 ft vertical, if that. I'll never forget the night I learned to use the T bar. I kept falling off but the operator wouldn't let me give up. Finally got it. I also remember my first method of stopping... falling down; and the time I almost ran over a little kid and his mother gave me hell. 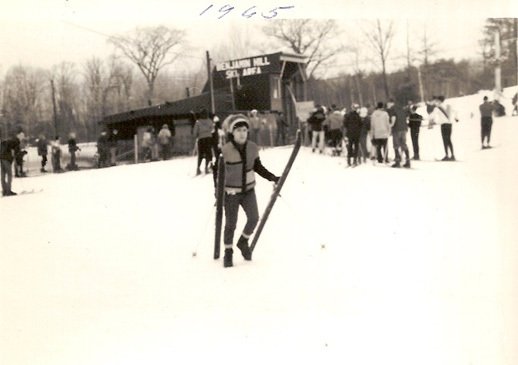 Caroline Frankovich: My sister and I learned to ski at Benjamin Hill in the 1960's. We think we started in the winter of 1965-66. I looked at the trail map you had and remember only ever using three tows. We started on the beginner's tow but often went to the rope tow shown furthest to the right and of course the T-bar. All I remember of the two rope tows furthest to the left is that they were often closed for some reason and not really in use very often. I think once I was very daring and skied over there - even though there were trails they weren't really open. We took many lessons there and learned the basics of skiing. Emily Wood: I happened upon your site by mistake, checked out if it included "Benji" and was pleasantly surprised to be able to take a nostalgic trip back to my childhood! I grew up practically next door and still vividly remember the sound of the clacking t-bar and the sight noise of the snowmaking at night looking out our living room window. There is a good size pool (open in the summer) that was nestled in front of the lodge. It was reopened this past summer by the town. There was a HUGE fire the night the lodge burned down but the ski area had already been shut down for some time. We went and watched the memories go up in flames - rumor was that it was set.. We used to ski over to "Benji" through the woods to the top of the mountain, take a free run down and then go buy our tickets. 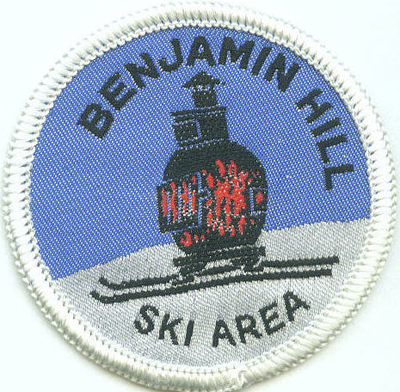 My brother helped build Benjamin Hill Ski Area and was on the ski patrol there. I'll try to find out when it actually opened. It was a very active place with night time skiing as well. A highlight of the season was the torch light runs. Affectionately called "Benjamin Bump" sure seemed huge at the time! A I think if you can learn to ride a t-bar you can ride anything!! 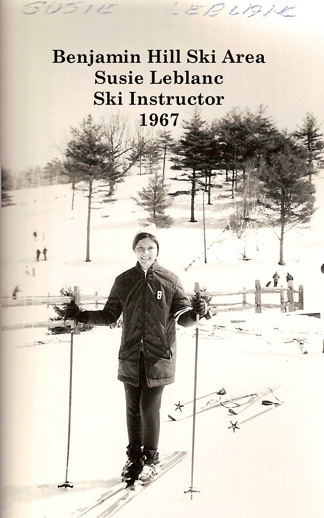 Donna Jacobites: In the winter of 1963 my father decided to take up skiing. He saw that it was a family sport, so he decided to put my two older sisters on skis (ages 6 and 7) and then slowly introduced the rest of his 6 kids to skiing. We had a family pass there for the next 10 years or so. It was a family sport, and we quickly got to know the other family season-pass-holders – the Quinn’s and Tucker’s are two of the names I can remember. Soon there was racing camp and we actually became competitive in the Eastern Mountain Racing Association!! My sister would leave the parking lot every weekend on a bus, and come home with a trophy! I always wondered how we could beat “mountain” kids, but I surmised that we had to learn how to ski better than them because we made so many turns on such a small hill! One of my sisters went on to captain the ski team at UMASS in 1980 and the rest of us turned in our skis for basketballs. The main T-bar always had a long line, and there were actually moguls at the top of the main run! We have video of taking my baby brother up on the T-bar between our legs when he was about 3 or 4 years old. My mother would back a lunch every weekend and I have fond memories of eating lunch outside on the deck when the sun was shining! I would venture to say that the strength of our family unit was cemented from those early days of skiing. The tradition has continued by our taking yearly pilgrimages to Mt. Wachusett on or about January 5th. My 9-year old son and my sister share similar birthdays, and we spend it reminiscing at Mt. Wachusett and getting the newest member of the family up on skis – even if they’re still in diapers! Last year my Dad presented me with a ski trophy that I was “jipped out of” from about 3 decades ago! The amazing thing is that he had the typed race results to prove it!!!!! George M.Walker II, M.D. :My fist job was at the "Benji Bump" in Shirley in the winter of 1964-1965. I believe it opened in 1963 for I went to school with children of the owners Hamilton and Ginger Heard. The T-bar was powered by a large Caterpillar bull dozer crammed into the shed at the "summit" of the lift. After the area closed at 10:00 p.m. we would start the snow guns and, keeping at least one rope tow open, then would ski for the next two hours unfettered by the usual big crowds. The Tucker family, who lived right next to the area, would usually join us. The base lodge was usually very active, featuring live bands on the weekends year round, swimming and socializing around the pool in the summer. When Benjamin Hill failed to open after the winter of 1971 many people felt the loss of some rather halcyon days. Henry Baker: Benjamin Hill -- I remember a very clear and open hill with few trees. I remember good frappes at the lodge. Energy crisis and no snow killed it. Sarah: I remember skiing at Priest's Ski Area in Groton, MA and later Benjamin Hill in Shirley, MA mostly in the early 60's. 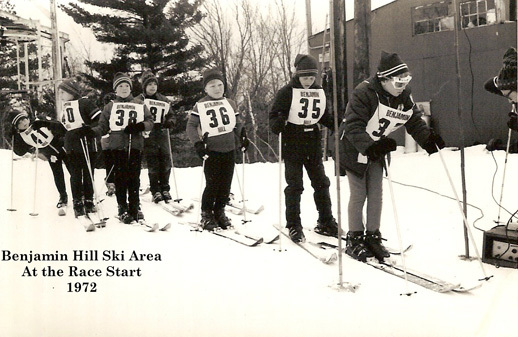 I won my first ski race at Benjamin Hill (my older brother called it Benjamin Bump) when I was five years old. The prize was a pair of brand new goggles. Hammy and Ginger Heard owned it and it was a very lively place. Nelson Lerner: The first place I ever skied was Benjamin Hill in Shirley. It had a bunch of rope tows and a T-bar (might have been a J-bar). I recall hearing that there was a fire sometime in the late 60's which might have been the end of it. I only skied there a couple of times. Benjamin Hill is where I learned to ski when I was 11 years old, in 1962. The family who owned it were Hamilton (Hammie) and Ginger Heard. They co-owned the Bradford and Heard Insurance Agency in Shirley, and Ginger was a member of the Parker family... of Parker Games in Salem, MA... perhaps you have heard of the board game Monopoly??? 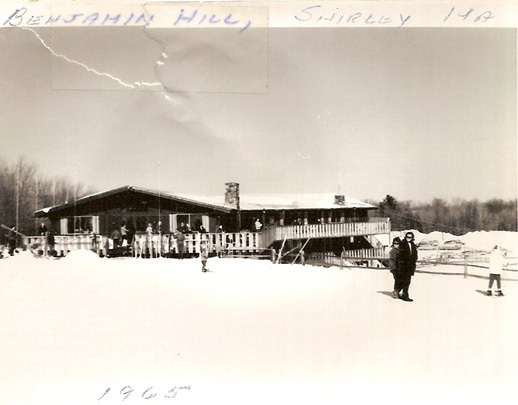 The Heard's were a fairly wealthy family in Shirley... and they took on this enterprise of building Benjamin Hill Ski Area and Swim and Tennis Club, which brought jobs and fun to the sleepy old industrial town. I lived 2 fields and woods away from Benjamin Hill, so when I would get home from school, I strapped on my old wooden Fischers and cross-country skied across those fields and woods to down-hill ski the rest of the afternoon and evening. (when did I do my homework?) I eventually was a member of the ski-patrol there along with my friends. In the summer there was a pool and tennis club: which was THE place to be if you were a teenager in Shirley. The club organized youth trips which included climbing Mount Washington the summer I was 16: 1967. If the Heard's or any of their 3 daughters or grandchildren ever read this: I want to thank you for making my teenage years in Shirley active and happy. Benjamin Hill was one of the first areas I visited in depth for NELSAP. There was quite a bit left in 1998 when I last visited the area. After it closed sometime in the 1970's rapid growth has set in and you can hardly identify that this was once an active ski area. The remains of the lifts were definitely burned, by vandals? 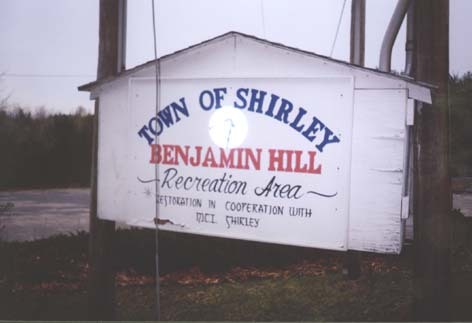 It is still used by the town of Shirley as a recreation area, with fields, playground, and a swimming pool. The T-bar lift has been partially removed (except for summit and base bullwheels). There were burn marks on these remnants hinting at a fire at one point. The base shack was all crumpled, but the top unloading station still stood. The unloading ramp at the top was completely grown in. 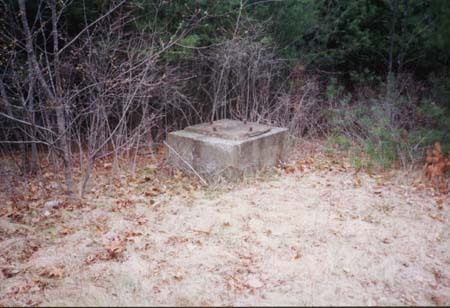 Also, the foundations for the T-bar were still standing. 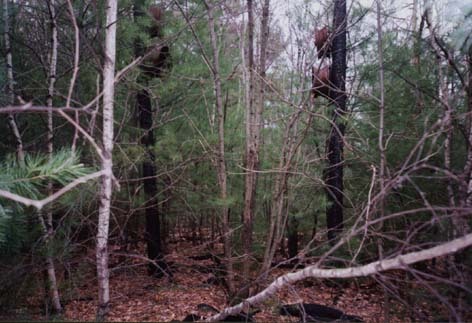 Similar to the T-bar, the rope tow remnants were scattered. One tall rope tow pole remained at the bottom, which was from the beginner lift. Assorted rope tow wheels and towers were all over this mountain. These too have burn marks on them. 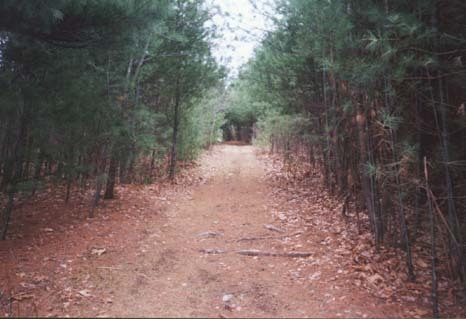 Almost all of the trails have grown in, but a few remain. One was a rope tow line given its straight character. I was able to hike to the top of this in under 2 minutes...must have been a very quick trip back down! Here are some pictures I took of the area. The base of the mountain, showing one trail to the left of that lone pine tree. The beginner rope tow tower at the base. Very slight slope at best! The lift line for the far right dual rope tows. The top of the double rope tow. Notice how the towers are burned. 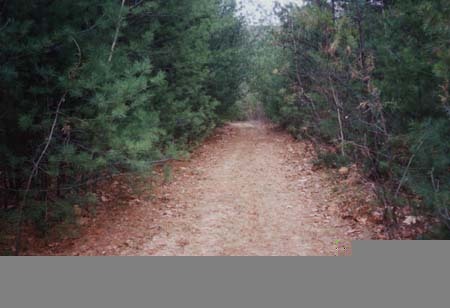 One of the trails on the east side of the hill. 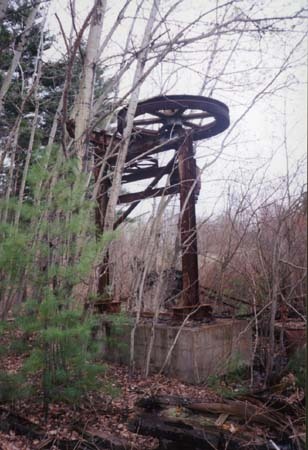 The burned base of the t-bar, showing the bullwheel. 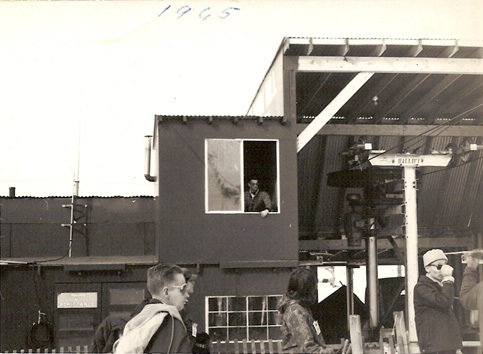 The top of the T-bar, the unloading station still standing. 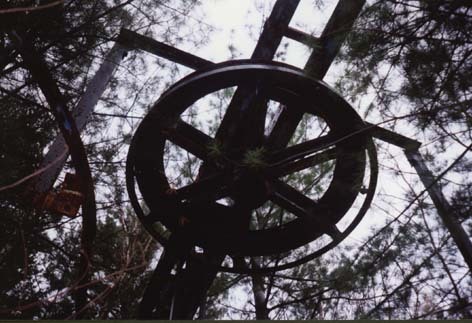 The top of the T-bar, showing the wheels on the unloading station. The area reopened for tubing (hike up and sled down) in the winter of 2007-2008. The town rebuilt the lodge with a snack bar, and refurbished the base area. From Neal Guthrie: "I am a member of the Benjamin Hill Park and Recreation area and stumbled across you're web site. The past few years we've had a hard working committee and built a new snack shack and bath house in the location of the old lodge. We also re cut a portion of the ski area to make a sledding and tubing hill for the kids in town. " 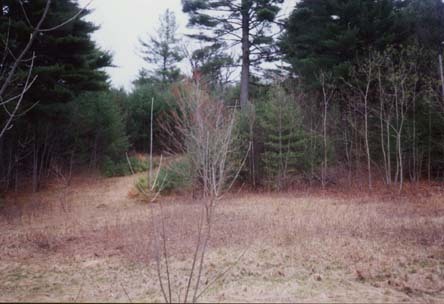 Here is a picture of the area in late 2007 sent in by B. Farrar, who works for the town of Shirley. Note the cleared slope behind the new lodge. 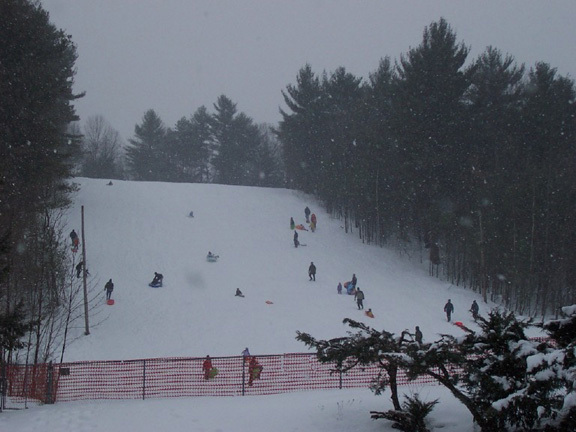 B. Farrar also sent us this photo of the tubing/sledding hill. Looks like everybody there having a great time! If you remember this area and have memories to share, please let us know.